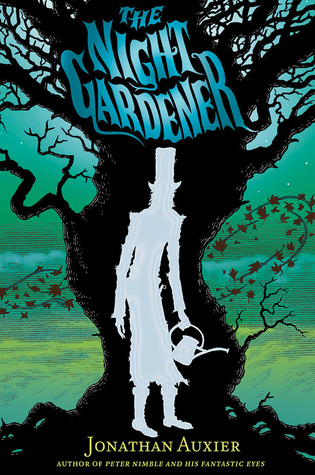 The Night Gardener is one of the most skillfully creepy novels I have ever read. When the story opens we are in 19th-century Victorian England and we meet young Molly and her brother Kip. Kip is lame and uses a crutch made by his father named ‘Courage.’ Maggie is full of brilliant stories about fantastical creatures, people and adventures. They are in the midst of a journey by wagon to a home where they have been hired as a maid and a groundskeeper by the owner who was in town on other business. We learn they are refugees from the potato famine in Ireland (people who were not looked kindly upon or treated well by the English when they fled starvation in their homeland). Their parents are not with them but the reader is not clear in the beginning what has happened to separate the family; we are aware only that Molly knows more than Kip and is trying to protect him from the truth. Along the road they meet an old storyteller named Hester Kettle. Hester is an unsettling character in that you are never really sure if she is wise and misunderstood or has darker motives. She warns the children about the ‘Sourwoods’ they are about to enter to arrive at their place of employment and succeeds in spooking them. Without money or food and no prospects to get any unless they have jobs, they have no choice but to proceed. The mansion is built around a dark–almost black–tree. The tree is actually partially inside the house. The Mistress and the two children–a little girl named Penny and an older, sullen boy named Alistair–are all unnaturally pale with dark hair and huge, dark eyes. The persistent unhappiness and secretiveness of the family makes Molly and Kip uneasy. One night Molly and Kip see a tall, strange figure in the house and on the grounds at night. The figure carries a shovel and a watering can. When they encounter Hester kettle again and she tells them the tale of The Night Gardener they begin to suspect their nagging fears about the evil in the Windsors’ home is justified. “I think I figured it out.” She sniffed, looking up at the stars. “Hester asked me what the difference between a story and a lie was. At the time, I told her that a story helps folks. ‘Helps ’em do what?’ she asked. Well, I think I know the answer. A story helps folks face the world, even when it frightens ’em. And a lie does the opposite. It helps you hide. Jonathan Auxier says he was inspired to write The Night Gardener by the Ray Bradbury story Something Wicked This Way Comes and works like The Legend of Sleepy Hollow by Washington Irving. I think it also has the spine-chilling, raise-the-hairs-on-the-back-of-your-neck suspense of Edgar Allan Poe’s The Fall of the House of Usher. The darkest aspects of 19th-century Victorian England is brilliantly captured and yet strikes a chord with contemporary readers through the extraordinarily well-developed main characters. If you love subtle scary stories that build incredible suspense and finish with a heart-pumping, edge-of-your-seat good versus evil showdown then The Night Gardener is for you!